Seven Stations with Blaw-Knox "Diamonds"
On March 12, 1906 Blaw Collapsible Steel Centering Company was formed in New Jersey to manufacture and market re-usable steel forms for molding concrete in heavy construction. The initial product line of the Blaw company was based on the patented invention of Jacob B. Blaw of Philadelphia. This invention was for a better way to set the concrete for the sewers than by means of the wooden forms normally used for such work. 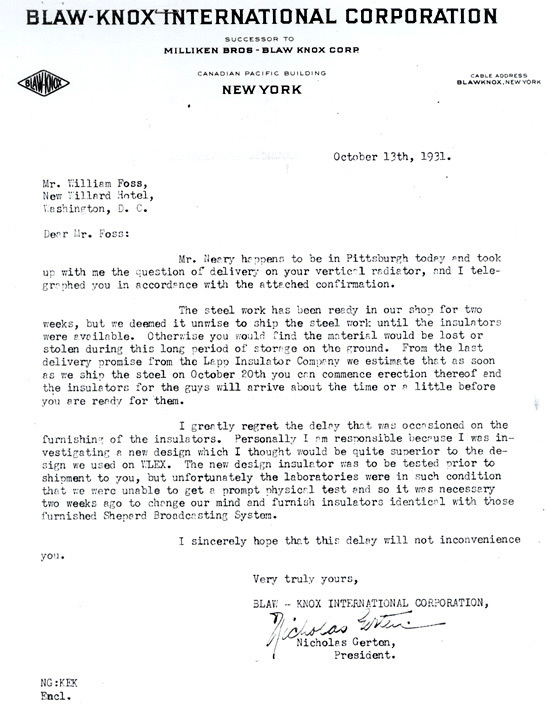 In 1909 Luther Knox and Irvin F. Lehman became associated in the establishment of the Knox Pressed and Welded Steel Co. Luther Knox pioneered the use of pressed and welded steel, in place of previously used non-ferrous castings, for the manufacture of water-cooled equipment for open hearth furnaces and for other high temperature applications. The Blaw-Knox Company name was adopted July 6, 1917, marking the merger of Blaw Steel Construction Company with the Knox Pressed and Welded Steel Company. This merger introduced the company to the steel industry and also brought together the three Lehman brothers into one business firm. 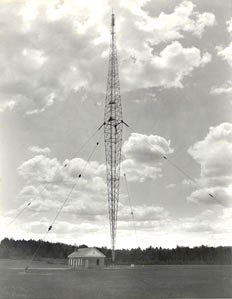 In 1927 the company added radio towers to its products. During its growth years Blaw-Knox acquired a number of companies. In 1929 A.W. French & Company became part of Blaw-Knox. This was a factor in eventually establishing a complete package of road-building equipment. Blaw-Knox is now a brand name of this equipment and is now part of Ingersoll-Rand. Blaw-Knox experienced less growth during the years of the Great Depression, but stayed in the black. The company was also involved in the manufacture of many products to support the efforts in WWII, such as: cast armor for naval vessels, turrets for tanks, anti-aircraft Bofors* gun mounts, Naval gun slides and mounts, rockets, projectiles, torpedo launching equipment and the operation of a 16-inch shell line, to name only a few. For it's excellence in the war effort, Blaw-Knox won seven Army-Navy "E" awards with 16 stars. *Bofors is a Swedish company. The above information was obtained from a 28 page booklet, published in 1957 entitled: "Blaw-Knox Growth Through Invention And Enterprise," which is the text of an address, given by W. Cordes Snyder, Jr., who was president of the Blaw-Knox company of Pittsburgh, PA. at the time. The text contains far more details of acquisitions, people and various products, facilities, which are beyond the scope of this page. However, since the address was given in 1957, there is a gap of information which is needed to bridge to it's present part of Ingersoll-Rand. Also, I have yet to find historical information on the decisions and engineering, which led to the design and installation of this type of radio tower. Input is invited. Six Stations with Blaw-Knox "Diamonds"
station now runs at 50KW daytime. for WFEA's owners in Portland, Maine. letter is dated October 13, 1931." diamond is now a utility radio tower. "WHO in Des Moines had one until the late 1940's, when it was replaced at the same site by the existing uniform cross-section tower. The bottom two-thirds of the old WHO tower was moved to the rear of an Iowa State Police station in Des Moines for use as a communications tower. 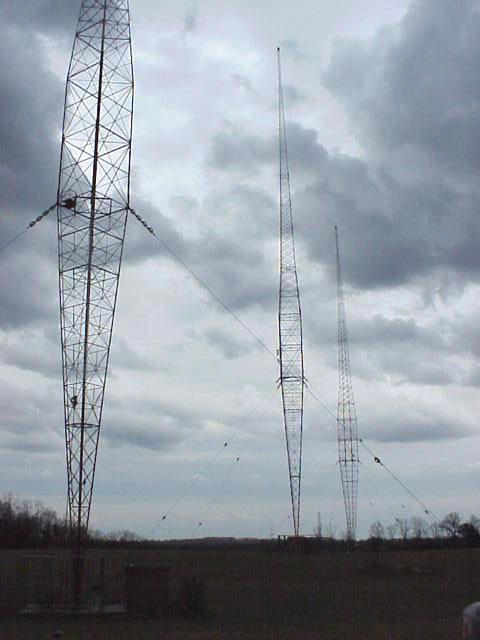 These towers are a special part of radio history. I have visited all of them, and they do make quite a visual impression. Most uniform cross-section towers all but disappear visually against many skyscapes, but not these. Their mass stands out against any color of sky, often resulting in strong visual images. 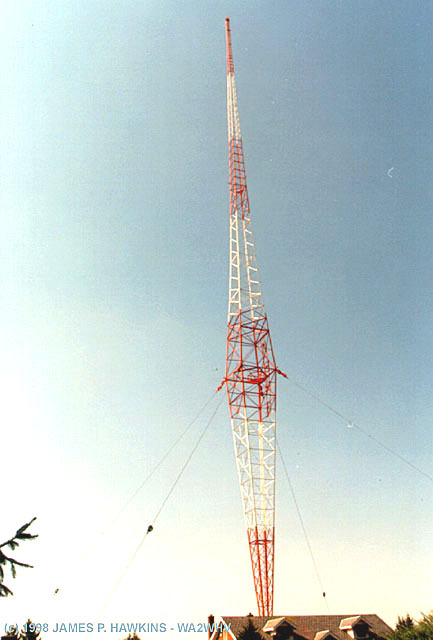 The WLW tower, with the call letters lighted in white at the mid-way point, makes a strong visual impression, especially at twilight." "Blaw-Knox dual cantilevered (center guyed towers). A.k.a. 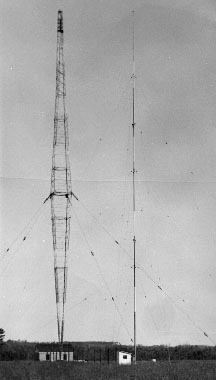 "diamond antenna". 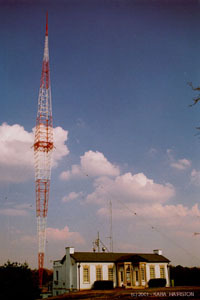 WSM-AM tower I-65 and Concord Road, Brentwood, TN. Any tower structure exhibits many dynamics that result from gravity, wind and temperature cycles. These forces are constantly at work and result in movements vertically and horizontally of the structure. These movements (even slight) result in tremendous tensions where the structure attaches to a very rigid earth through its foundations. Most specifically the horizontal twisting that results, becomes a formidable "moment". To compensate for this, either the strength of the structures lower components (where the moving tower meets the non-moving foundation) must be massive enough to compensate for this "moment" or attached to the foundation through a hinge mechanism in the form of a pivot. Thus the tapered base we see on most towers of significant length. With all this in mind we can reason that for a tower of the height of 808 feet the dynamics (movements) are integral to the mass of the structure. The higher the tower, the size and strength of the lower supports must grow at an un-proportionate rate. If this tower were not tapered, the lower supports (where this twisting moment couples to the foundation) would have to be so large as to make the project extremely costly to accomplish. In the case of AM towers that are electrically insulated from the ground, the problem is magnified because the tower has to rest on porcelain insulators that would be located at the transition to the foundation. The point of maximum force. In a pivot attachment, the moment is not critical because the tower can rotate on its base. 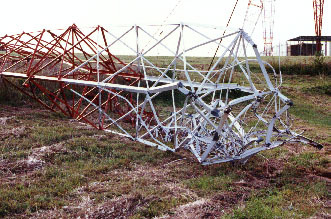 This is why tower manufactures use this mechanism to this date. The WSM tower lower half is made up of larger steel members than the top section. Where the bottom taper is linear, the top is not. There is a transition at about the 680-foot level. Eight guy cables are attached at the joining section between the tapers. The entire weight of the tower and the pull of the guy cables rest on a two-section series pivotal Lapp insulator. This tower represents the construction methods and technology at the time. The laws of physics remain unchanged. The WSM tower was erected in 1932 and began operation from it late that year and is still in-use today. The tower was designed and manufactured by The Blaw-Knox Steel Company of Pittsburgh Pa. The original mechanical drawings are very detail. The erection crew was from South Carolina. Originally, the WSM tower was 878 feet tall. 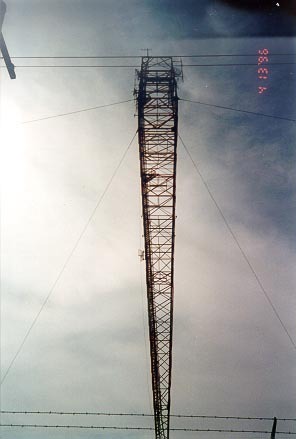 This included 758 feet of square structural lattice then 120 feet of tapered mast. By 1939, it was determined the tower was electrically longer due to velocity effect. This contributed to a very high angle of radiation that resulted in a groundwave/skywave cancellation (fade) over Chattanooga some 120 miles distance. This condition was alleviated by this adjustment in height to 808 feet. As a side note, part of the mast was erected as the flagpole for the adjacent Lipscomb School. It was in use there until 1996 when the original school building was replaced. 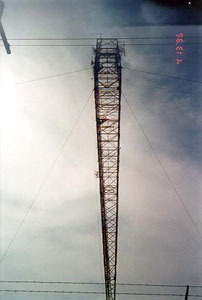 50 feet of the pole still exist on the top of the tower. 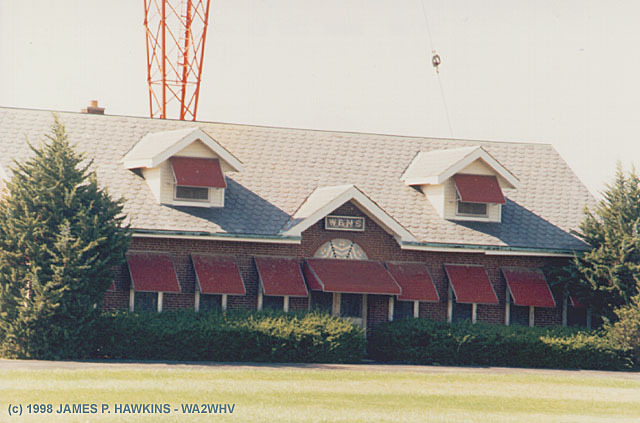 It was used to support a turn style antenna for the FM station that WSM operated at this location from 1939 until 1952. 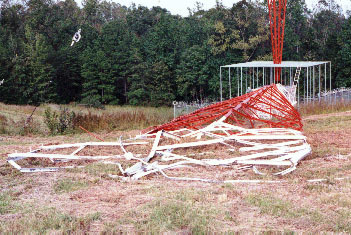 The original antenna was in the 45 MHz band. After World War II, the FM allocation moved up to 100.1 MHz. The antenna was replaced with another turn style antenna. That antenna is still up there. 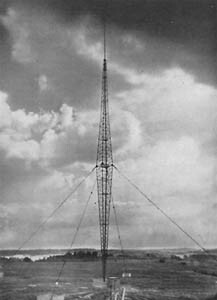 WSM relinquished the FM station license in 1952 as television was on the scene and FM broadcasting was no where near profitability. Blaw-Knox went out of the tower business in 1958. 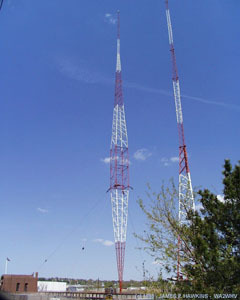 There are several of these types of towers still in use besides the WSM tower. 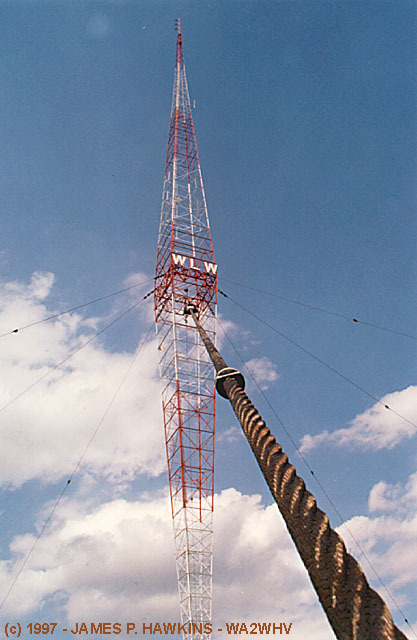 The same crew that installed the WSM tower installed the WLW tower near Mason Ohio. In fact, the crew went directly to Ohio when they finished WSM. There are three shorter versions of these towers at WBT in Charlotte, NC. Blaw-Knox built taller towers as well. 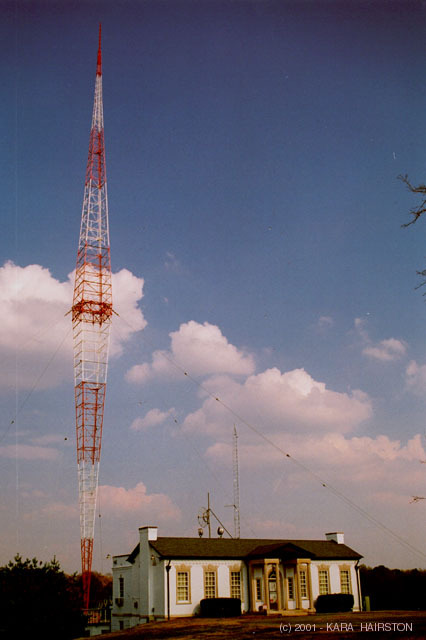 The WSMV-TV tower is 1369 feet tall and has a 12-foot width face. This tower supports the antennas of WSMV-TV, WSM-FM and WZTV-TV. It is the classic pivotal base sectional guyed tower. Prior to using the Blaw-Knox tower, WSM used a "cage" type antenna that was supported by two self-supporting towers. 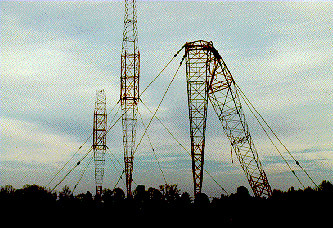 A wire was strung between the towers and a vertical feed wire fed the center from a tuning house directly centered between the towers. This was also referred to as a "flat top" antenna. Dr. George Brown et. al, of RCA fame, impressed the FRC with his vertical, series fed antenna that used 120 quarter wavelength radials as 360 degree counter-poise. There have been no improvements on this design to date. Dr. George Brown (like Blaw-Knox) is deceased. 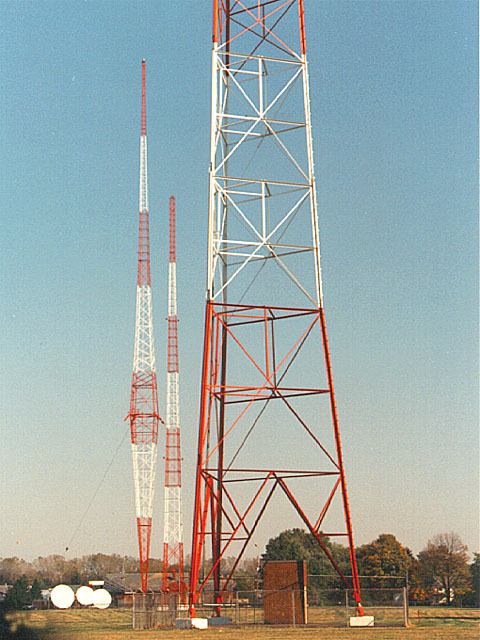 There has been some suggestion that the Blaw-Knox tower was designed to be "fat" in the middle to accommodate a current loop (I max) in a 1/2 to 5/8 wave length tower. This was purely consequential and was not a consideration in the design of the tower." This photo of the WBT towers was taken by J.T. Anderton. According to J.T., they remained in that state for a couple of months, while WBT ran on a one-tower special temporary authorization (STA)(10-kw non-DA, as he recalled). The towers were rebuilt exactly the way they were before the damage. "electronics" magazine is a publication of the McGraw-Hill Publishing Company, Inc.
was referred to in print locally as "the third of its kind" in America). Fabricated steel, one of the principal products of Blaw-Knox Company, includes mill buildings, manufacturing plants, bridges, crane runways, trusses and other construction of a highly fabricated nature. A corps of highly trained engineers is maintained for consulting and designing services. Four legged straight line or suspension towers, anchor and dead end towers, latticed and channel A-frames, river crossing towers, outdoor sub-stations, switching stations, signal towers, steel poles, derrick towers. We specialize in the design and fabrication of high tension transmission lines. Riveted, pressed and welded steel plate products of every description, including: accumulators, agitators, water boshes, annealing boxes, containers, digesters, filters, flumes, gear guards, kettles, ladles, pans, penstocks, air receivers, stacks, standpipes, miscellaneous tanks, miscellaneous blast furnace work, etc. Clamshell buckets and automatic cableway plants for digging and rehandling earth, sand, gravel, coal, ore, limestone, tin scrap, slag, cinders, fertilizers, rock products, etc. For installation on derricks, overhead and locomotive cranes, monorails, dredges, steam,shovels, ditchers, cableways, ships for handling cargo and coal, etc. Steel form for every type of concrete construction: aqeuducts, bridges, cisterns,. Columns, culverts, curbs and gutters, dams, factories, floors, foundations, houses, locks, manholes, piers, pipe, reservoirs, roads, sewers, shafts, sidewalks, subways, tanks, tunnels, viaducts, retaining walls, warehouses, etc. Knox patented water-cooled doors, door frames, front and back wall coolers, ports, bulkheads, reversing valves, etc., for Open Hearth. Glass and Copper Regenerative Furnaces: water-cooled standings, boshes and shields for Sheet and Tin Mills. All images are Copyrighted and are provided for your personal enjoyment. Use of these images for commercial purposes including their distribution on CD-ROM or any other media without permission of the owner is prohibited.